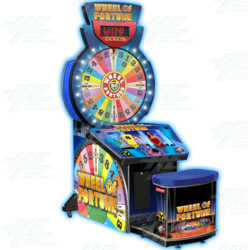 The Wheel of Fortune Deluxe is a puzzle style ticket redemption machine from Raw Thrills; it's a fully licensed product based off the hit TV show. With its bright LED lighting, colourful 36" fully replicated Wheel of Fortune, authentic sounds as heard on the show, and 4, 000 puzzles to enjoy, this game will attract old and young alike in a bid to test their wits and their luck. The game comes with a 32" LCD touchscreen, on which players can select to play either the standard "Wheel of Fortune" or take their chances with the "Double Play" option that offers players three spins to try and maximize - possibly double- their ticket winnings. Just like the show, a puzzle will appear with a category, and players will then spin the colourful Wheel of Fortune dial to gain a ticket value. Once they have gained a ticket value, players select three letters, and totals will soar when multiples of letters appear in the puzzle (e.g. if three T's appear that would mean the player receives 3x the original ticket value). After selecting the letters, players can win bonus tickets by solving the puzzle. A game for the keen of mind and quick-witted, the Wheel of Fortune Deluxe ticket redemption machine from Raw Thrills is a must-have addition to any arcade space. The Wheel of Fortune Deluxe is a puzzle style ticket redemption machine from Raw Thrills; it's a fully licensed product based off the hit TV show. With its bright LED lighting, colourful 36" fully replicated Wheel of Fortune, authentic sounds as heard on the show, and 4, 000 puzzles to enjoy, this game will attract old and young alike in a bid to test their wits and their luck. The game comes with a 32" LCD touchscreen, on which players can select to play either the standard "Wheel of Fortune" or take their chances with the "Double Play" option that offers players three spins to try and maximize - possibly double- their ticket winnings. Just like the show, a puzzle will appear with a category, and players will then spin the colourful Wheel of Fortune dial to gain a ticket value. Once they have gained a ticket value, players select three letters, and totals will soar when multiples of letters appear in the puzzle (e.g. if three T's appear that would mean the player receives 3x the original ticket value). After selecting the letters, players can win bonus tickets by solving the puzzle. A game for the keen of mind and quick-witted, the Wheel of Fortune Deluxe ticket redemption machine from Raw Thrills is a must-have addition to any arcade space. 36" Fully Replicated Wheel of Fortune. Dual Ticket Dispenser or Coupon Printer Operation. Bright LED Display for Point Total. Officially licensed Product Based on the Hit TV Show. Bench Style Seat (Optional at Additional Cost).